In June 2018, the Bewani Oil Palm Plantation (BOPPL) in West Sepik, Papua New Guinea confirmed that its mill, Vanimo Green Palm Oil Limited, was due to be commissioned. When the BOPPL mill is commissioned, deforestation-linked crude palm oil could enter international supply chains. Currently, BOPPL is not compliant with the No Deforestation, No Peat, No Exploitation (NDPE) policies that cover 74 percent of Indonesia’s and Malaysia’s refining capacity. The BOPPL refinery could supply the ‘palm oil leakage’ market. The Bewani Oil Palm Plantation (BOPPL) in West Sepik province covers a Special Agricultural Business Lease (SABL) of 139,090 ha. The concession is made up of a mixture of primary and secondary forest. The project began in October 2010 with an estimated 20,000 ha deforested since then, including 1,548 ha deforested in 2018. Since 2010, BOPPL has been dogged by legal and social issues. In June 2013, the PNG Commission on Inquiry on SABLs found widespread fraud and abuse in thesystem. The Commission recommended that the Bewani SABL be revoked. In early 2017, Papua New Guinea’s Prime Minister declared all SABL’s illegal and cancelled them. In February 2018, Loop PNG reported that the BOPPL license had again been declared illegal by theLands Minister Justin Tkatchenko. This was contested in The National newspaper, owned by theMalaysian logging and palm oil company Rimbunan Hijau. The NGO ActNow PNG has campaigned against the BOPPL SABL. It claims that the company has not respected local people’s land rights and reneged on promises to people living near the plantation, specifically relating to the provision of health care and education. ActNow PNG also claims that thecompany used force to encourage local people to sign over rights to their land. Regional leaders have accused the police and army of providing support to the company. BOPPL has stated they are looking at the Asian market as a place to export their crude palm oil. TheGovernor of West Sepik confirming the first shipment would leave PNG in July 2018. It is believed representatives of the company are currently trying to secure buyers within the region. The commissioning of the mill became known after the National Planning & Monitoring Minister Richard Maru visited the plantation and surrounding area as part of a fact finding mission in June 2018. BOPPL’s Plantation Manager told Maru that 12,000 ha had already been planted with oil palm trees, and around half are already being harvested. There are plans to plant 20,000 ha of oil palm trees by 2019 or 2020. BOPPL is believed to have previously sent fresh fruit bunches 76 kilometers across the border in to West Papua to a mill owned by PT Perkebunan Nusantara II, while BOPPL’s mill was being developed. 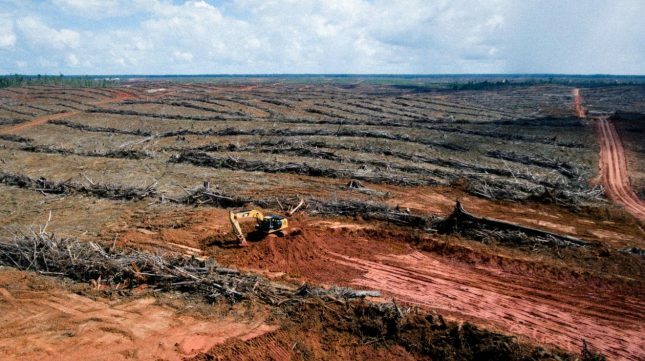 Chain Reaction Research covered BOPPL in its June 2018 report Shadow Companies Present Palm Oil Investor Risks and Undermine NDPE Efforts. The BOPPL example underlines the risks for consumer goods companies, traders, investors, banks and plantations. If these parties are involved with companies/plantations which have NDPE policies but which are related to shadow companies like BOPPL, they could face reputation and market risks.